Here at Enchanted Bridal Boutique we have devoted passion and respect for all our brides-to-be and all visitors. Our aim is make every fairy-tale dream into a reality, you will have a one to one bridal consultation as we wish to make every bride feel special and to be remembered in her wedding dress not just noticed in it, after all every wedding dress starts with a proposal and our proposal is to help you find your perfect dress for your perfect day. If you have your heart set on ‘that dress’ then we will give you the full fairy-tale bridal experience with a sparkle of inspiration, as one of the most exciting parts of planning your wedding is shopping for your wedding dress. The boutique is very calm and relaxing and your bridal entourage are very welcome to join you as the boutique is very spacious with 3 large fitting rooms and a family area, there is ample parking around the High Street and this is free at weekends. We are committed to service, quality and reliability as we know that your walk down the aisle will be the memory of a lifetime and we would love to be part of that special moment. When it comes to style, price and collections we have something to suit every bride-to-be and we are committed to making you the most beautiful bride for your groom and your special day. 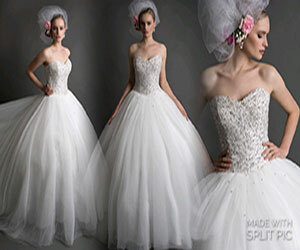 So let Enchanted Bridal Boutique make your bridal dreams come true and lets have fun doing so !. Dreaming of your fairy tale wedding dress, come along to a luxurious setting with a unique one to one service to find your perfect wedding dress. From your first consultation appointment through to your final fitting with our experienced seamstress you will receive our undivided attention. We are based in Old Harlow, Essex, come down and visit our bridal store and try some dresses on? Please call us on 01279 445556.